MONO! has been my first iOS Game that I released on the App Store. It has been created when it first became possible to create mobile apps using Adobe Flash/Air. My goal was to get throuh every step of the development process from concept to release. That includes the concept, artwork, animations, coding, project-management, dev environment setup and a little bit of marketing. As MONO! was supposed to be my first mobile game the concept has been really simple: The goal is to collect circles and rectangles depending on the symbol that is shown in the middle of the screen. The circles and rectangles are spawning outside of the screen and are flying towards the center. The user can collect these be switching the center-symbol to the one that is about to collide with it. He can only switch once per second. If the colliding symbol and the centers one are identical the user earns points. If not: he loses one of three lives. Optional you can destroy symbols be tapping on it. But you won’t get any scores for that. The mood of the game is aimed to be really relaxing. The blue color and the slow particle effects and the music help to archive the targeted mood. This beautiful relaxing game demands your tactical skills, good reflexes and sharpens your concentration. 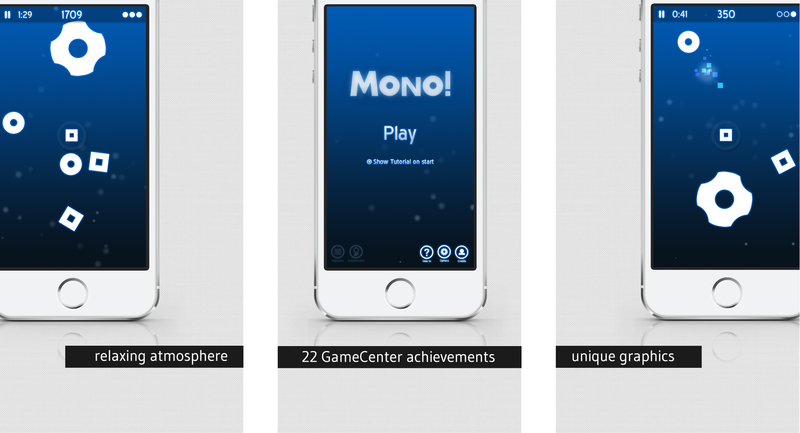 Let the unique graphics and the stunning Soundtrack enchant you while you crack the highscore and become the best Mono! player of all time.